MD Anderson Cancer Center is part of an effort to combine two powerful therapeutic strategies — oncolytic virotherapy and cancer immunotherapy — to defeat cancer. MD Anderson’s Dr. James Allison and Memorial Sloan Kettering Cancer Center’s Dr. Dmitriy Zamarin and Dr. Jedd Wolchok teamed together to investigate synergism between these two therapies to boost the immune response against cancerous tumors. Their findings were published in Science Translational Medicine. “Many patients have benefited from cancer immunotherapies,” said Dr. Zamarin. Largely pioneered by Dr. Allison, cancer immunotherapy antagonizes the T-cell receptor CTLA-4 to prevent activated T-cells from being “turned off” by tumors. Cancer immunotherapy mediated by the agent ipilimumab is used clinically, but “has not been effective for all patients, or against all cancer types, since most cancers can potently suppress immune responses. We want to extend the benefits of immunotherapies to more patients and optimize their use against a larger variety of cancers,” said Dr. Wolchok. Consequently, the team evaluated cancer immunotherapy paired with the Newcastle disease virus (NDV), a virus derived from birds that invokes an immune response. The researchers found that injecting NDV into one of two tumors in mice caused CD4+ and CD8+ T cells to infiltrate the tumor. Systemic CTLA-4 blockade then allowed the immune response to continue. Interestingly, the second, non-injected tumor also had immune cell infiltration. 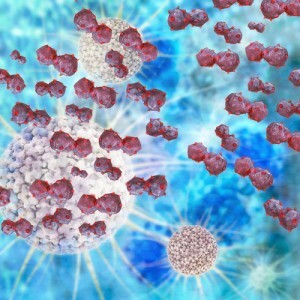 Dr. Zamarin explained, “We also found, to our surprise, that a similar infiltration of activated immune cells occurred in a distant tumor, one in which the virus was never detected.” This may be because the NDV alerted T cells of the presence of cancer cells, and the T cells dramatically dialed-up their anti-tumor response. What’s more, reintroduction of tumors to the treated mice led to swift elimination of the new tumors, demonstrating the durability of the immune response. This study enhanced the use of oncolytic virotherapy by injecting NDV directly into the tumor; usually, the immune system is able to disable the virus before it can target tumors. The study also enhanced immunotherapy by forcing the body to recognize tumors through NDV injection before tumors could inactivate T cells. Combination of NDV with other immunotherapies may also be beneficial, and Dr. Zamain noted that NDV can be engineered to package and express immune factors that further boost the anti-tumor response. These possibilities are under investigation, as well as work to evaluate combination immunotherapy in early stage clinical trials.